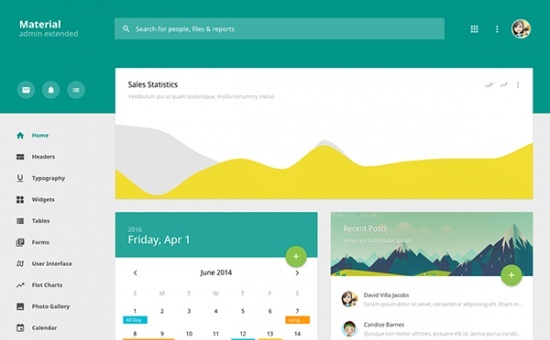 Material Design Admin Extended is a Google Material Design inspired powerful-lightweight fully responsive retina display compatible admin template based on latest Bootstrap 3. - All pages are HTML5 validated and neatly coded. - Fully Responsive design, supported for desktops, laptops, smartphones and tablets. - Uses LESS and Grunt. - Built on latest Twitter Bootstrap. - Complete User Interface elements and components. - Sample pages included such as Profile, Messages, Listview, Login etc.